The Dartmouth women’s track & field team finished in second place after two days of competition in the 2018 New England Outdoor Championship at Memorial Field. The competition featured 39 total schools. The Big Green scored 25.5 points on Friday, half a point less than the University of New Hampshire and half a point more than Northeastern University, the two-time defending champions. Julia Valenti ’20 secured 10 points after finishing first in the pole vault event, clearing 13-1.5/4.0m on her second try. Maria Garman ’19 took first in two events, the high jump with 1.74m and the shot put with 10.86m. The standings were similar on the second day. The Big Green finished the meet with 99.62 points while Northeastern won its third straight women’s title with 121 total points. Garman added yet another victory, this time in the 800m event. Nicole Deblasio ’19 added 18 points total and won the 200m with a time of 24.29s. Lily Lockhart ’21 took first in the discus event, with her second throw of 45.33m surpassing the runner-up’s throw by over 10 centimeters. The team will find out by Wednesday who will be attending the 2018 NCAA East Regionals, held in Tampa, Florida. The Dartmouth men’s track and field team finished in fifth place at the New England Outdoor Championships this weekend, a drastic improvement from where they stood after the first day of competition in 12th place. Southern Connecticut State University took the top spot in the event, finishing with 113.50 points, more than 40 points ahead of the next competitor. Pat Gregory ’18 finished first in the 1500 meter run with a time of 3:46.74, more than half a second ahead of William Ulrich of the University of New Hampshire who finished in second. Miles Irish ’18 took third in the 1500 meter run with a time of 3:50.33, and Amos Cariati ’18 took third in the 400 meter dash with a personal record of 48.15. The Big Green will learn by Wednesday who will be going to the 2018 NCAA East Regionals, held later this month in Tampa, Florida. The Dartmouth men’s lightweight rowing team competed at the Eastern Association of Rowing Colleges Eastern Sprints, with entries in the first, second and third varsity lightweight eights. All three Big Green boats finished in the petite final on Sunday, with both the first and second varsity eights taking second in their respective races, and the third varsity taking third. The Dartmouth lightweights will look to finish off their season alongside the heavyweights at the Intercollegiate Rowing Association National Regatta in June in New Jersey. 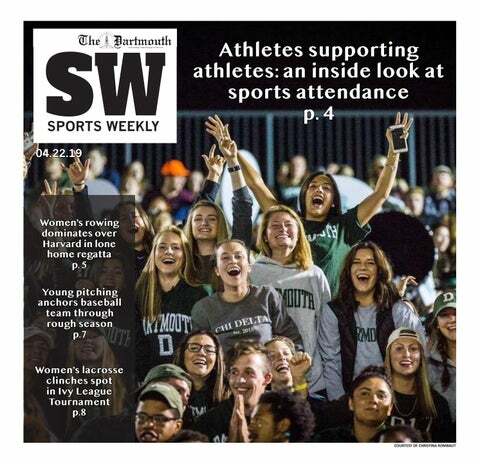 The Dartmouth softball team fell to Harvard in both games on Saturday, May 12 in the Ivy League Championship Series, hosted in Hanover. The Big Green entered the weekend as conference champions but tied with the Crimson as co-champions of the Ivy League after losing the series. Harvard received the automatic NCAA Division I Championship bid with their win over the weekend. The Big Green lost 6-4 in the first game and 4-1 in the second, finishing the season with a 22-18 overall record and a 16-5 conference record. In the first game, the Big Green took a 4-1 lead by the bottom of the fifth inning, but the Crimson scored five runs in the top of the seventh, all with two outs on the board, to clinch the victory. Harvard took the lead early on in the second game and Dartmouth had a difficult time overcoming the Crimson defense. Dartmouth finally scored in the seventh inning to cut the lead to 4-1, but a pop up by the next batter ended the game. The Big Green was expected to come in fifth in the preseason poll as they did last year, but pulled off a stunning season by finishing first in the conference. The Dartmouth men’s heavyweight rowing team competed in the Eastern Association of Rowing Colleges Eastern Sprints regatta on Sunday at Lake Quinsigamond in Worcester, Massachusetts. The Big Green finished well across the board, with both the fourth varsity eight and first varsity eight finishing second in their respective petite finals. The third varsity eight and second varsity eight both made it to the grand finals, also both finishing in sixth place, rounding out the weekend for the Big Green. The Dartmouth heavyweight men will end their season at the Intercollegiate Rowing Association National Regatta on June 1 at Mercer Lake in New Jersey. The Big Green and Harvard University faced off in a double header on Sunday at Cambridge and will play a third game on Monday, May 14. Dartmouth is currently in second place and will need to remain in the top two in the Ivy League to earn a spot in the best-of-three championship series next weekend. The Big Green and the Crimson have split the two games played, with Dartmouth winning the first 6-5 and Harvard taking the second 11-3. In the first game, with the score tied at 5-5, the Big Green tacked on one more run in the seventh inning to secure the win. Sean Sullivan ’19 scored two runs for the team. In game two, Dartmouth took a 1-0 lead in the fourth inning, but Harvard exploded offensively in the second half of the game to clinch the win. The Crimson scored three runs in the fifth, sixth and eight innings, along with two in the seventh, for a total of 11 runs. While the one win officially eliminated Harvard from the race, the Big Green may still need to win the final match on Monday depending on how Columbia University does. Columbia split its two games over the weekend 1-1 with Cornell University, and if Columbia wins again on Monday, then the Big Green will also have to win on Monday. Outfielder Dustin Shirley ’18, a co-captain for the baseball team, was named as one of 12 players to the Academic All-District I Team on May 10, the first Big Green selection since 2014. He has had a stellar season, leading the Ivy League with 13 doubles and recording a team-best .462 slugging percentage and 28 RBIs. The No. 27 ranked Dartmouth men’s tennis team fell to No. 33 Oregon University 4-0 on Saturday, May 12 at Texas Christian University’s Bayard H. Friedman Tennis Center. The Ducks improved to 18-9 but fell to No. 8 TCU the following day. The Big Green had an amazing season with an overall record of 20-6, which began with a 12-match winning streak — a program record. The Big Green won its first Eastern College Athletic Conference indoor title, made the national rankings and won its first Ivy League title since 1997. The conference win earned Dartmouth an automatic bid in the NCAA Tournament. Before the match against Oregon, Charlie Broom ’20 and David Horneffer ’20 were selected to the first team for both doubles and singles, while Dan Martin ’21 was selected for the second team for singles. Head coach Chris Drake was also named Coach of the Year. The Dartmouth women’s rowing team had a strong race, managing to advance all five of their boats to the Grand Final at the Ivy League Championship on Sunday, May 13. The championship was held in Camden, New Jersey on the Cooper River. The Big Green placed third in most of their varsities for heats. To finish off the weekend meet, the first varsity placed in sixth. Princeton University beat out Yale University by two seconds to win the first varsity event and claim the Ivy League title. The second varsity placed in sixth, and the 4A was in fourth. The 4B placed in sixth. In the grand final, the third varsity placed third. At the end of the meet, Sabrina Bohrer ’18 was named to the All-Ivy First Team and Zoe Dinneen ’18 was put on the second team.